The garden with a conscience, a ‘Garden of Hope’ and a ‘World Beyond Walls’ were just some of the themes of exhibits at the annual garden show, Bloom Festival, in Dublin’s Phoenix Park at the weekend. 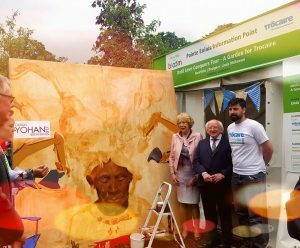 Trócaire, Pieta House, Oxfam Ireland and GOAL all sponsored gardens and were at Bloom to raise awareness and spread their message. President Michael D. Higgins officially opened Bloom, highlighting how the share of the world’s population living in urban areas and cities is predicted to rise to over 65 per cent or by an additional 2.5 billion people by the middle of this century. “As the world continues to urbanise, therefore, and as cities continue to grow into mega cities, it is clear that much of the drive towards reversing the consequences of climate change must come from cities, as well as the sustainability which must permeate farming and agriculture,” he said. “Well-planned cities are cities with enough green public spaces, thus providing essential opportunities to reduce emissions, noise and pollution, while at the same time improving the welfare and recreational life of their citizens,” he said. 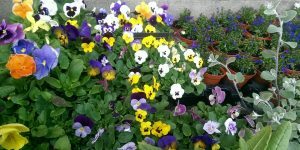 He spoke of the many social inclusion and charitable organisations present, and said that their gardens offer “many visions for a better society”. Trócaire stated its entry was a garden with a conscience and described Bloom as “an amazing five days showing off the stunning Trócaire garden and sharing the stories of communities around the world that we walk alongside thanks to the generosity of people”. Linda Mc Keown created this contemporary garden titled ‘Until Love Conquers Fear’, which highlights Trócaire’s vision for a just and peaceful world and its belief that everyone has the right to peace and dignity and access to clean water and sustainable land. The garden has an outer arid, barren space, depicting landscapes and communities that have been devastated by natural disaster and conflict. This contrasts with a lush oasis on the inside, symbolising visible, sustainable rejuvenation made possible through Trócaire’s intervention. Trócaire wanted the garden to help deliver its message to a new audience at Bloom, as well as reinforcing its message with existing supporters. 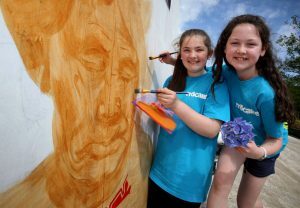 The garden included a mural designed by Ciaran Brennan and painted with the help of five students from sixth class in Scoil Moibhi Milverton, Skerries, Co Dublin, a co-educational Catholic primary school. Ciaran Brennan said that the mural represents Trócaire’s work in Central America and depicts an indigenous woman whose head dress is being attacked by outside forces. This garden and mural are moving to a permanent home at St Patrick’s campus in Maynooth. Niall Maxwell designed the Oxfam and GOAL-sponsored garden titled ‘A World Beyond Walls’ as a vibrant social space that highlights the need for tolerance and acceptance in a world that is becoming increasingly divided. The back wall of this garden represents the many border walls that are currently being constructed around the world today. Some of the brutal concrete-like slabs have been removed from the wall and transformed into communal seating areas for people to share lunch, for the foot-weary to rest, for children to climb on and for all to enjoy in a spirit of harmony and unity. Designers Laura Cassin, Louise Jones and Linda Murphy combined their creative flair to come up with the design for the ‘Teagasc Garden of Hope’. This garden aims to provide a peaceful space for spiritual renewal, reflection and ease. It will go to Pieta House. There were other gardens and stands which highlighted the work of NGOs, charities, schools and other community groups. St Joseph’s Secondary School (part of Edmund Rice Schools Trust) in Drogheda was delighted to see its LCA student Thomas Finnegan chosen to compete in the Postcard Garden competition. Entitled ‘Drogheda on the Boyne’, Thomas’s design was selected from thousands of entries, and features historical landmarks including the Viaduct, Millmount and St Laurence’s Gate. A frequent visitor to Bloom, Thomas was inspired by the creativity and hard work that the designers put into their gardens and hoped that one day he could also display a design at Bloom. He entered on behalf of the Green School Committee in the school, of which he is president. He assembled a team at the school to help construct his design at the school and then move and assemble it on site in the Phoenix Park. All plants for the design were purchased locally.